Fancy up bonus spins on the latest slot game from Yggdrasil Gaming? Play this weekend at Mr Green Casino to get up to 100. The bonus spins promotion runs until Sunday the 20th of January (2019) until 22:59pm UK time. 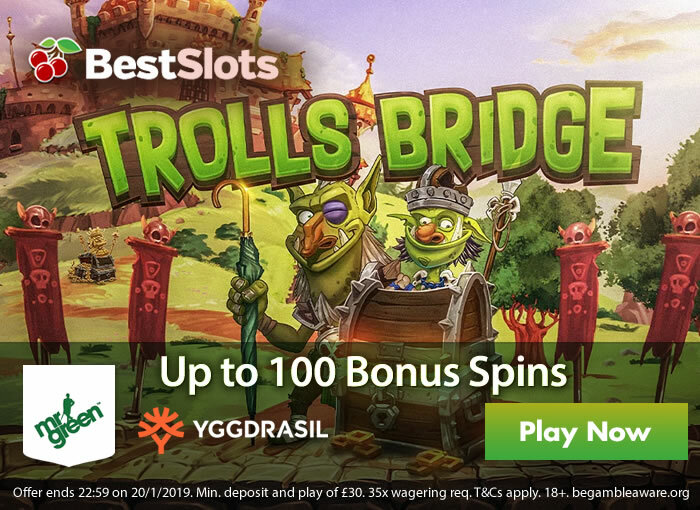 There’s up to 100 bonus spins on Yggdrasil Gaming’s Trolls Bridge up for grabs. To take part, you need to opt in (from the Mr Green Casino homepage once you’re logged in). Then you need to deposit and stake £30 or more on Trolls Bridge – you will get 1 bonus spin for every £1 you deposit and play up to 100. So if you were to deposit and wager £100, you’d get 100 bonus spins on Trolls Bridge – it’s that simple. Any winnings from the bonus spins comes with 35x wagering requirements. Trolls Bridge is a 5 reel, 20 payline slot game which features rowdy giants and has a Warcraft feel – with a fantasy theme, you can use the Golden Bet feature which gives you 1 more feature pick in the all-important Free Spins Bonus feature. You can begin with up to 10 free spins with 5 feature picks such as additional free spins, sticky wilds, Trolls wilds, random wilds, 2x multipliers and super stacked Trolls. There’s also a Bonus Stone feature where multipliers up to 5x can be applied to a winning combination or a big cash prize can be won if you don’t get a win. For more details, read the full Trolls Bridge review. Not played at Mr Green Casino yet? With well over 1,000 slot games to choose from, all the latest games like Pragmatic Play’s Mustang Gold, Blueprint Gaming’s Rome: Rise of an Empire, Play ‘N Go’s Raging Rex and ELK Studios’ The Wiz can be found. Register now to get an exclusive 20 Starburst bonus spins when you sign up – no deposit needed. Then, on your first deposit, you will get a 100% match bonus up to £100 plus 200 more bonus spins.